"The first squadron to be based at Wratting Common, then known as West Wickham, was 90 Squadron, which had been re-formed at Bottesford, Nottinghamshire, on 7 November 1942. 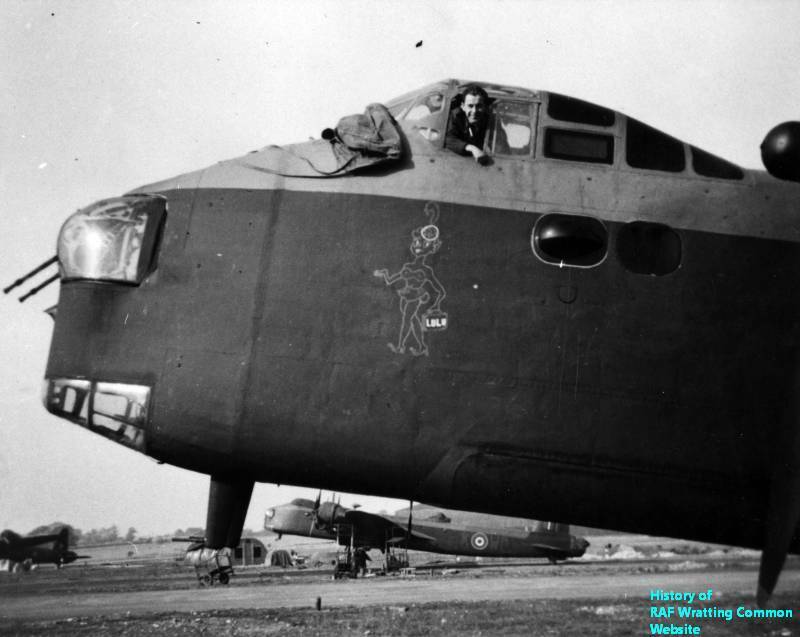 It had subsequently spent five months at Ridgewell (then a satellite of Stradishall), only to be moved on again when Ridgewell was required for use by the USAAF's 381st Bombardment Group. 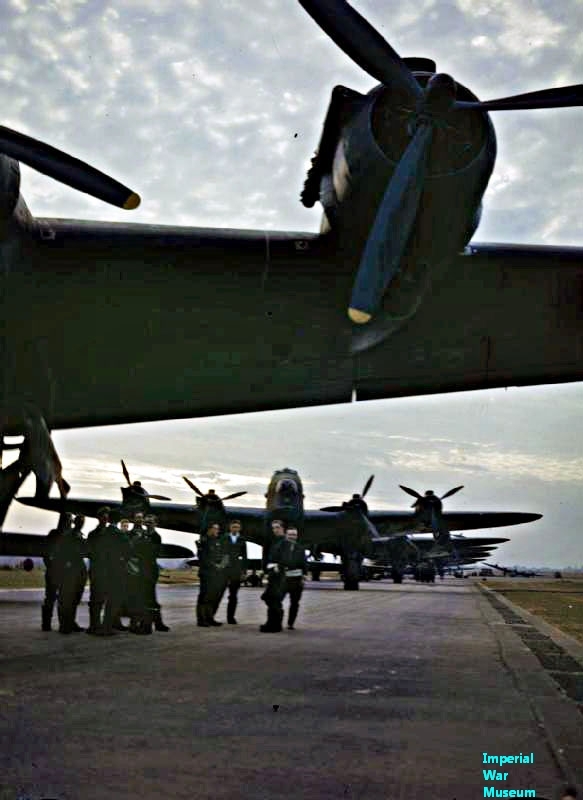 An advance party made the short journey from Ridgewell on 30 May 1943, and the main party and the Squadron's Stirling aircraft arrived next day. 90 Squadron's first operation from West Wickham was detailed for the night of 3/4 June 1943, and ten Stirlings took off to carry out a 'gardening' (mine-sowing) mission at Deodars which was regarded as fairly successful. Seven of the aircraft 'planted vegetables' as ordered, two jettisoned early and returned to base and one brought its load back. 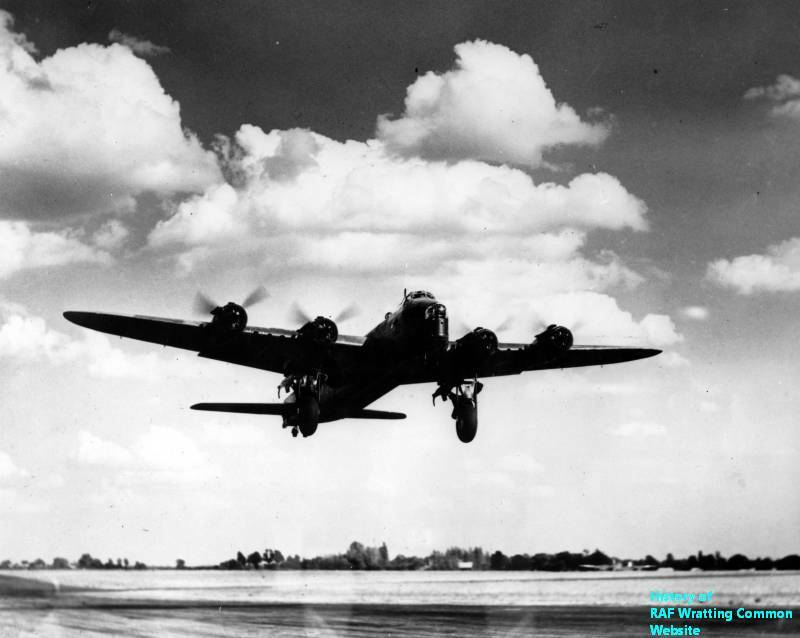 Subsequent operations planned for the nights of 4/5, 7/8 and 9/10 June had to be cancelled due to bad weather, but it was while bombing-up was taking place on 9 June that a major accident was averted. A 1000lb and two 500lb HE bombs and 36 incendiary bombs dropped from the bomb-bay of Stirling BF527 while being checked, causing three of the incendiaries to explode and start a fire in the aircraft. The fire was put out within ten minutes, but four airmen had to be given first aid treatment before being transferred to White Lodge Hospital in Newmarket. Dusseldorf was the target for 90 Squadron's Stirlings on the night of 11/12 June, and fourteen aircraft bombed on target indicators, causing two major explosions seen when leaving the area. Next came an attack on industrial targets at Le Creusot and Le Breuil by fourteen aircraft, among them a number of new Stirlings Mk.Ill which were now arriving from Short Bros. at Belfast and from Maintenance Units. Then came 90 Squadron's first loss sustained while at West Wickham. Eighteen aircraft were detailed to raid Krefeld, and all took off around midnight on 21/22 June 1943. Of the eighteen, one returned early after jettisoning its bombload in the sea, but the rest attacked the target. One of the newer Stirlings, EE887, captained by P/O H. N. Peters, failed to return. A similar pattern of operations continued through the summer of 1943, raids on industrial targets in Germany being interspersed with mining operations by relatively small numbers of aircraft. Inevitably, some Stirlings failed to return to Wratting Common, as the airfield was called from 21 August 1943. Apart from the one already mentioned, five were lost in June 1943, five in July, four in August and three in September, a sad toll. However, as there were now 27 operationally fit crews, a third Flight, "C" Flight, was formed within the Squadron on 7 August 1943, enabling large scale missions to be carried out. Such a raid was arranged for 17 August 1943, when 90 Squadron was called upon to provide aircraft for the attack on the rocket research station at Peenemunde. This was considered to be a very important operation and the might of Bomber Command was to be used, at considerable risk. The Squadron's problem was that many of its Stirlings had been diverted due to weather problems on their return from Turin the previous evening. When these aircraft had not returned to Wratting Common until after midday there was little time left for repairs, air tests, refuelling and bombing-up, and no time for sleep for the crews. Nevertheless the Squadron was able to muster sixteen aircraft, one of which dropped out with a defective starter motor. 90 Squadron was in the first wave of the attack, and so its relatively slow aircraft were the first to take off, the first one being airborne at 2028 hours. All the 90 Squadron aircraft returned safely from this raid, in which Bomber Command as a whole lost forty aircraft. Stirling EF426 was attacked twice by fighters on the way home; during the second attack the enemy aircraft was hit and broke off the attack, and was subsequently claimed as 'damaged'. While on its bombing run, EE896 was attacked by a Ju.88; both aircraft fired but there were no hits by either side and the enemy again broke off the attack. Nineteen of 90 Squadron's Stirlings took off in balmy weather on the evening of 22 September 1943 to carry out a raid on Hanover, and, once airborne, the crews settled down to the job in hand. Over the target, Stirling EH944 was attacked by a Ju.88; it immediately caught fire, and the rear gunner was killed. The pilot, W/O R. F. Denton, suffered severe leg injuries, the navigator, Sgt. R. W. Suddens, lost a hand, and Sgt. O. N. Jones, the flight engineer, received minor injuries. Before long, two of the engines failed and the pilot ordered the two uninjured crew members, the bomb-aimer and wireless operator, to bale out. As the pilot could not operate the rudder pedals unaided, Sgt. Jones helped him while at the same time struggling to maintain power on the two serviceable engines. By the time the English coast was first sighted, fuel was running low and the three men, badly fatigued, realised that the most difficult job, landing safely, was yet to come. Most of the electrical system had failed, the radio was out of action, and the landing gear could not be lowered except by hand, an impossible task in the circumstances. Soon the lights of Wratting Common's runway were spotted, but, being unable to make contact with the aircraft, the airfield controller suspected a German intruder and switched the lights off. The fuel gauges told the three crew members that they had very little time left and they began looking for a more hospitable airfield. A few minutes later they saw one and made a straight-in approach to a successful crash landing. Only after they were rescued from the crippled aircraft did they discover that they were at RAF Lakenheath. For the gallantry displayed in this episode, Sgt. Jones was awarded the CGM, which, for NCOs, is outranked only by the VC, and he received his medal from HM King George VI on D-Day, 6 June 1944. W/O Denton received the DFC and Sgt. Suddens the DFM. 90 Squadron was now approaching the end of its stay at Wratting Common, and during the final two weeks six operations were mounted, three on targets within Germany and three sowing mines around the Frisian Islands and the Kattegat. During the final such operation, on 7 October 1943, one Stirling was shot down into the North Sea by fire from an unidentified ship, but six of the seven crew members were picked up by a Royal Navy destroyer. After the operation on Bremen on 8/9 October, 90 Squadron rested for a few days before an advance party consisting of three officers, 67 other ranks and five WAAFs left for their new base at Tuddenham. The move was marred, however, by the deaths of all but the rear gunner aboard Stirling EF426 that day. After failure of the starboard outer engine while in the airfield circuit, the aircraft overshot, made a steep right-hand turn into the dead engine and side-slipped into the ground, with tragic results. Next day, however, the Squadron's remaining 23 Stirlings flew to Tuddenham during the afternoon, and 453 officers, 405 ground crew, 175 aircrew and 44 WAAFs forming the main party followed by road, bringing to an end 90 Squadron's short but eventful stay at Wratting Common."